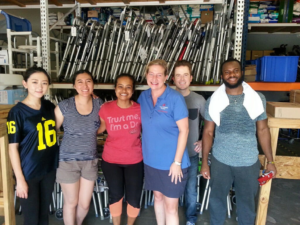 We sincerely appreciate your kindness and support to help RSVP and United Spinal bring together Second Saturday equipment distribution this weekend. We will be sharing info on the FB page and through this sign up Genius as the week progresses. Please read them. Please direct any patient needs to our phone, and direct them to leave a message. 855.825.7787(RSVP). The calls are triaged and returned asap. We are trying to secure basic items for volunteers and those in need like food, water, pop up tents, etc. -you will be asked to sign a waiver. you must do so to volunteer. 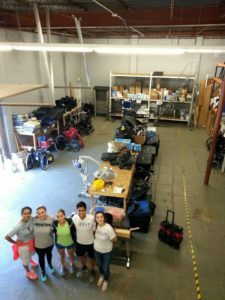 We are waiting on DME supplies to get shipped to Houston. As they are rolling in this week, we will be setting up the warehouse best we can. We have received GREAT support from our manufacture reps, vendors, people we’ve never met before, people around the country & Canada, and other non-profits working together. As with everything related to Hurricane Harvey, we don’t know what to expect. We do know everyone cares and will be doing their best! Please support the teamwork of the group as the week goes along. We are doing our best to get the info out there, along with all the other things we are all experiencing together … flooding, supporting friends/family, returning to work, stress, appreciation … and more. Thank you for joining in RSVP’s Second Saturday. I know more than ever, the Rehab Team is a great group of people who care and want to make the best possible happen for those we love and serve. We are grateful.